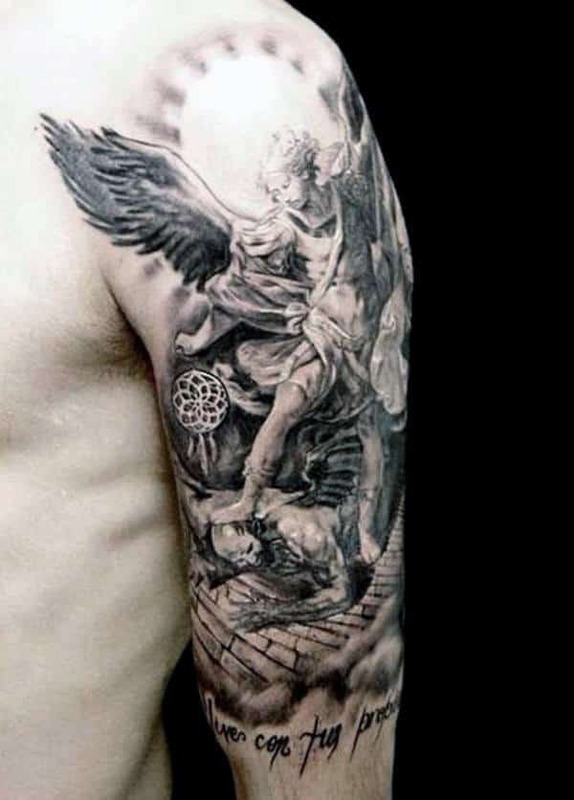 In return, they provide protect and guide us against evil and our destructive desires. 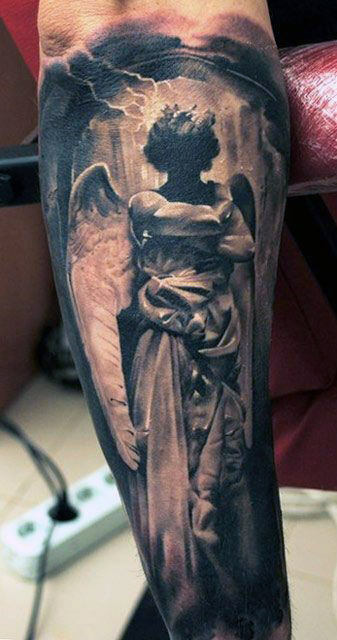 Should a man happen to encounter his death, some believe angels will guide them into the afterlife. 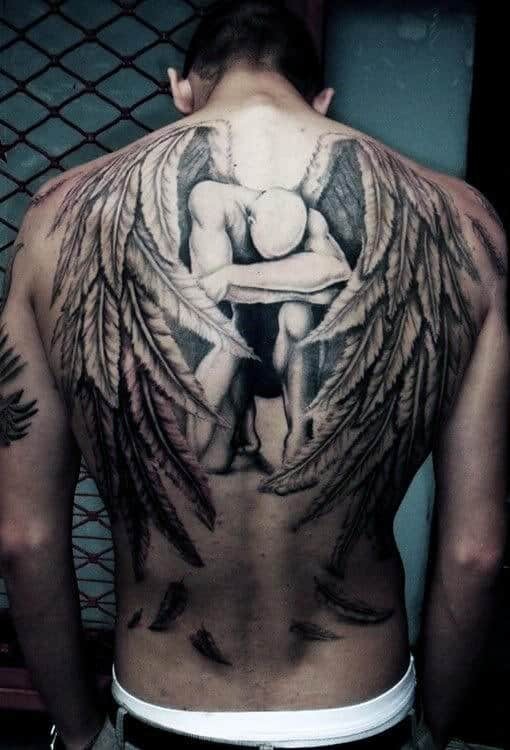 However, no matter what you believe, with all religion aside, wings and winged angels can represent something far deeper. 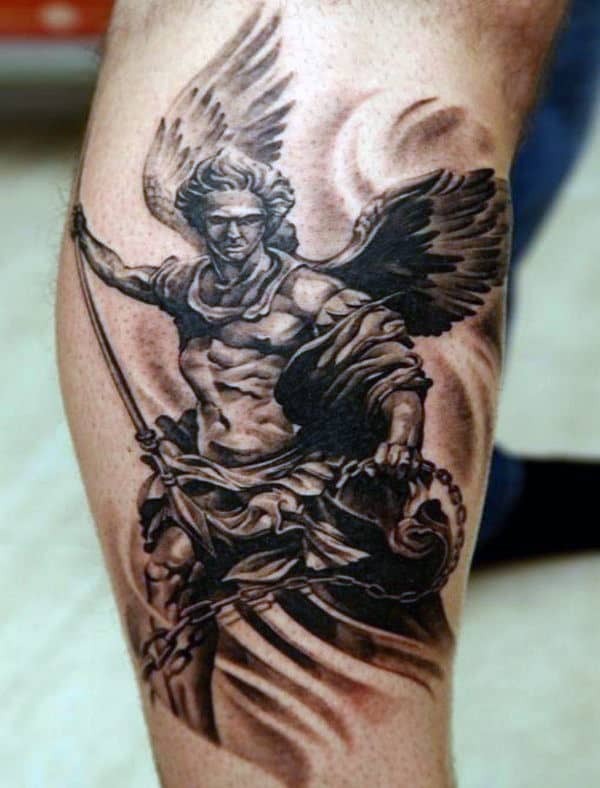 Take for instance fallen angels who can be seen as rebellious and thus thrown out of heaven, a family, social circle, etc. 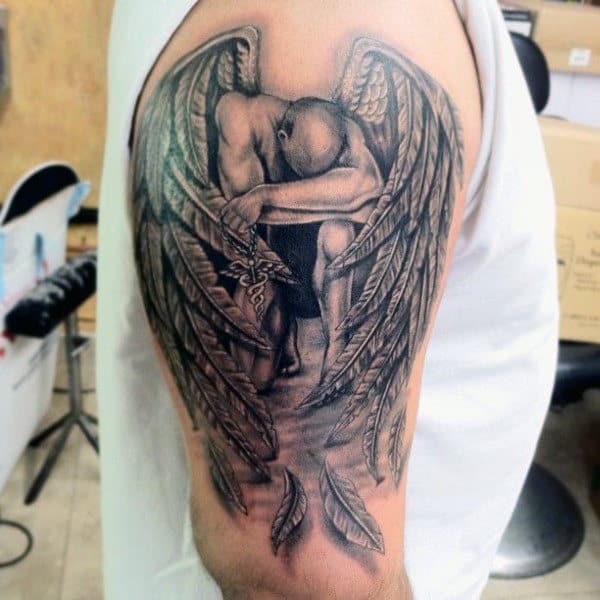 The purpose behind this idea can stand for negativity or sorrow, such as remembrance, suffering and pain. 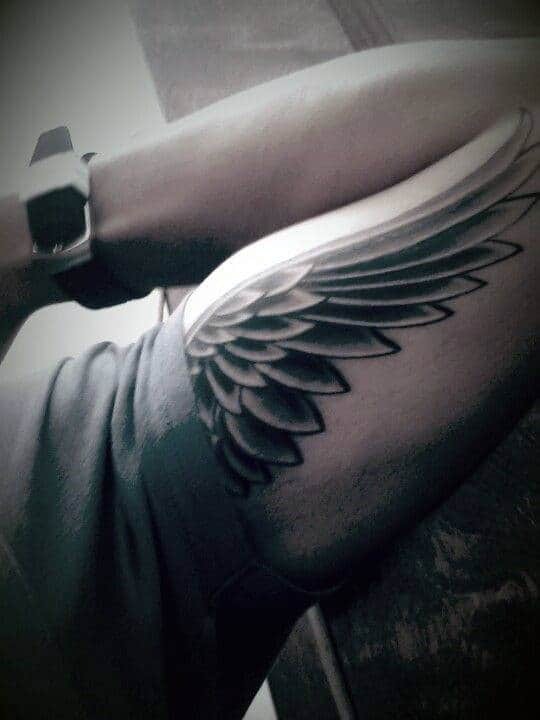 Or on the other end of the spectrum, the ability to rise above after failures or troubles in our life. 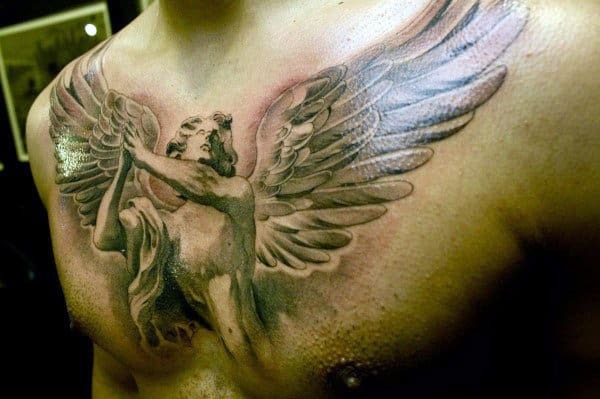 Perhaps as an accomplishment we wish to remember forever, or a person that helped guide us on our journey through life. 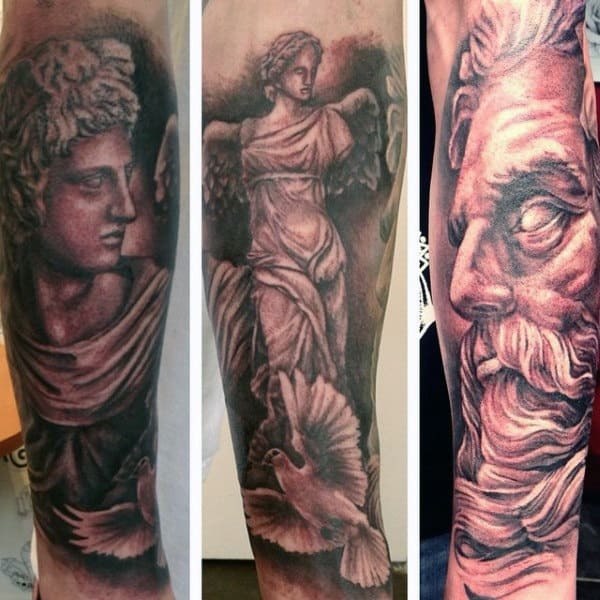 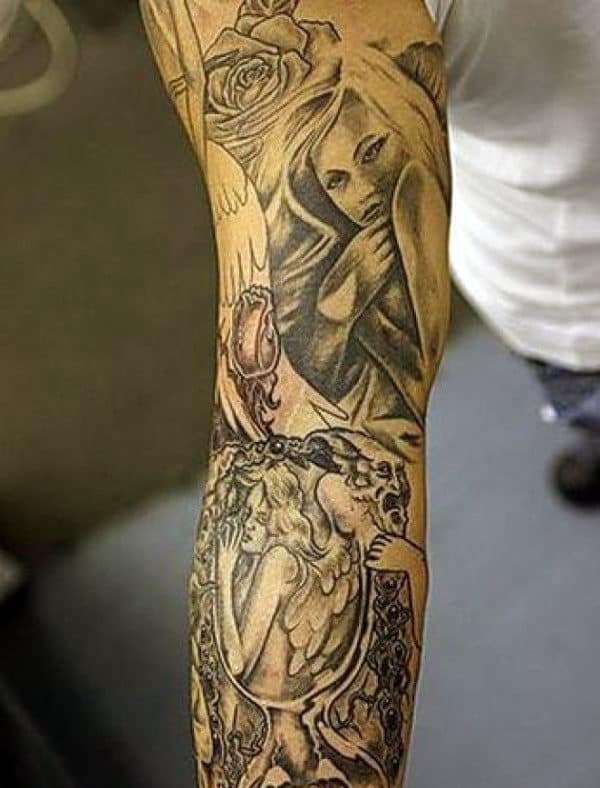 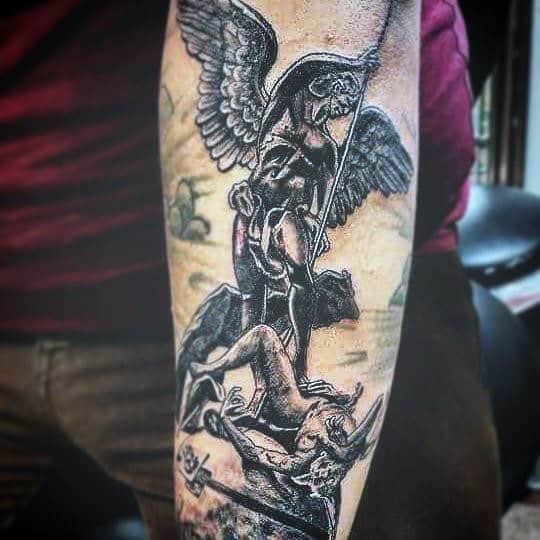 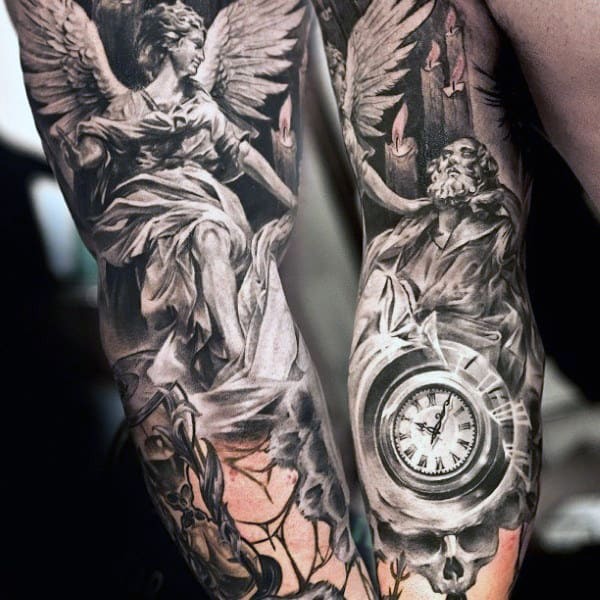 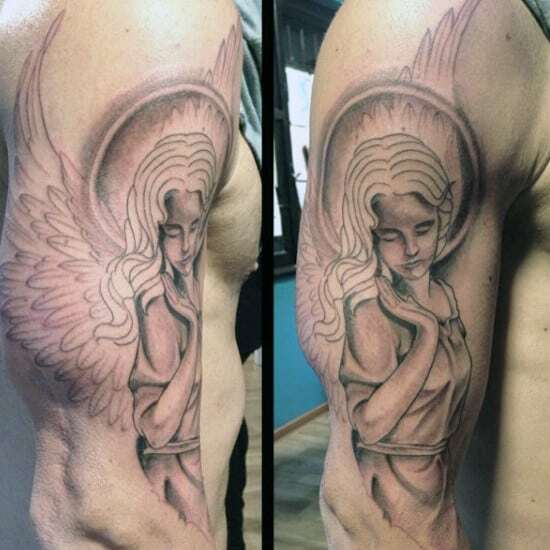 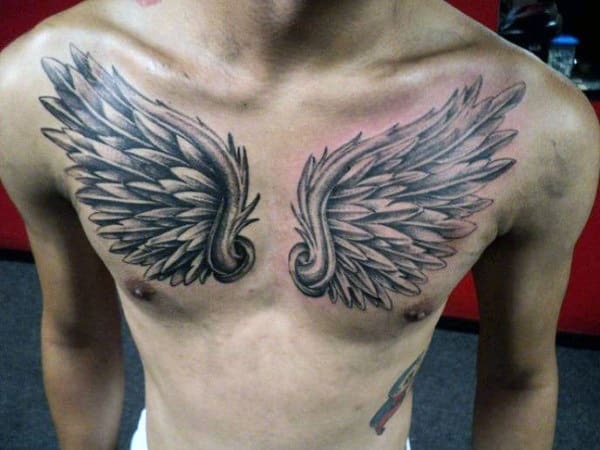 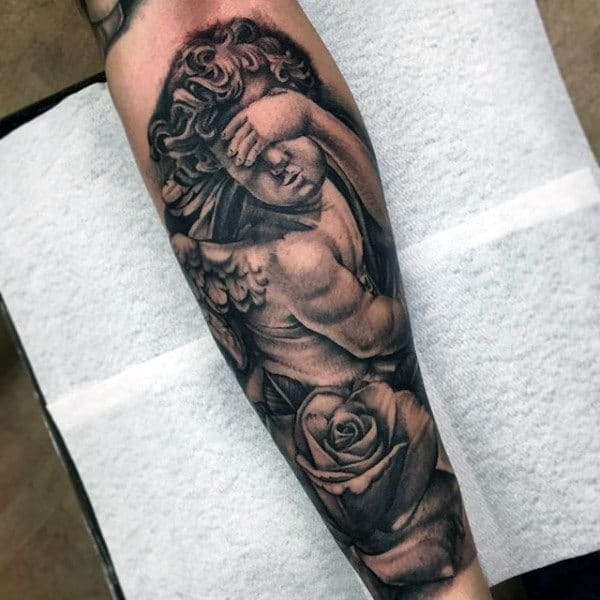 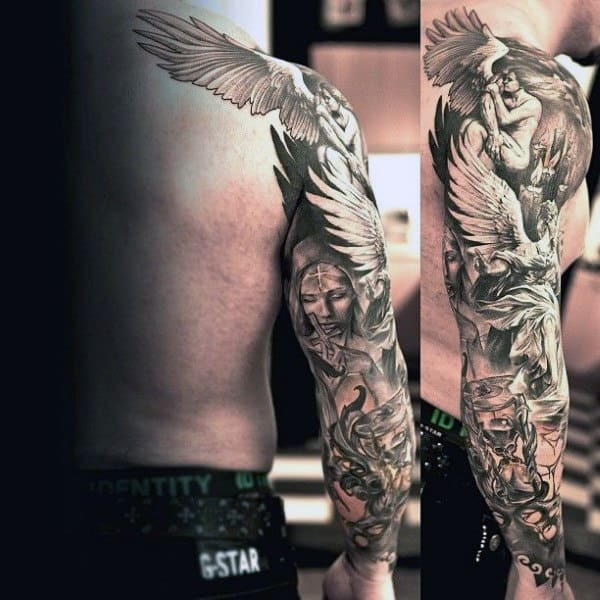 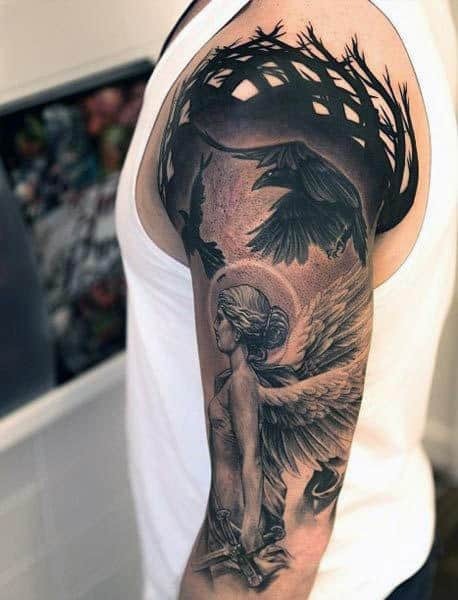 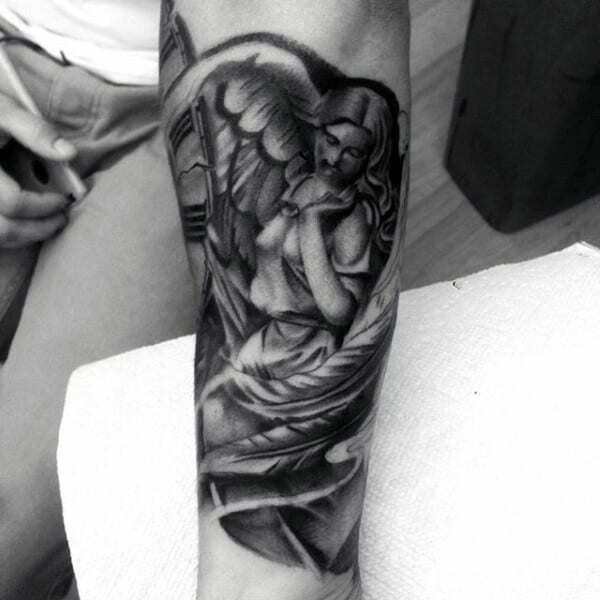 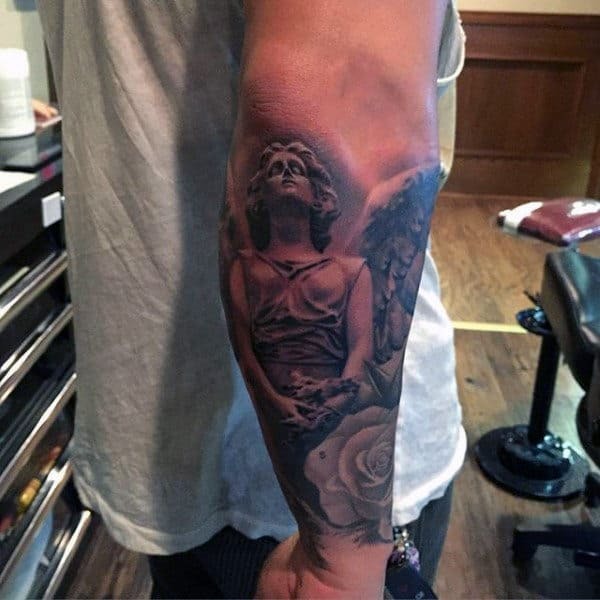 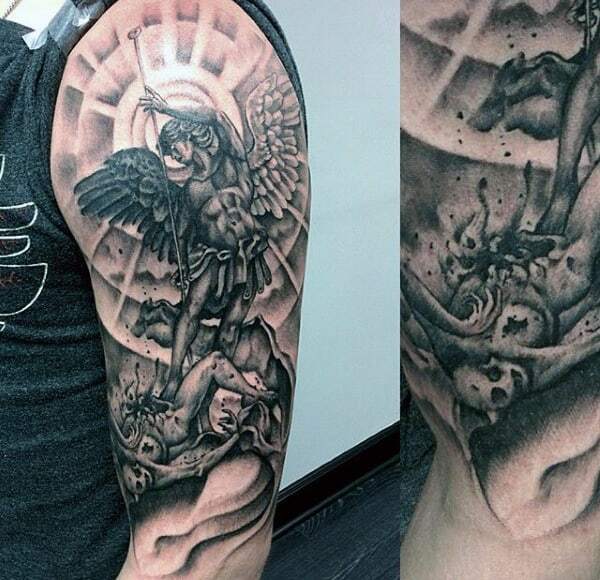 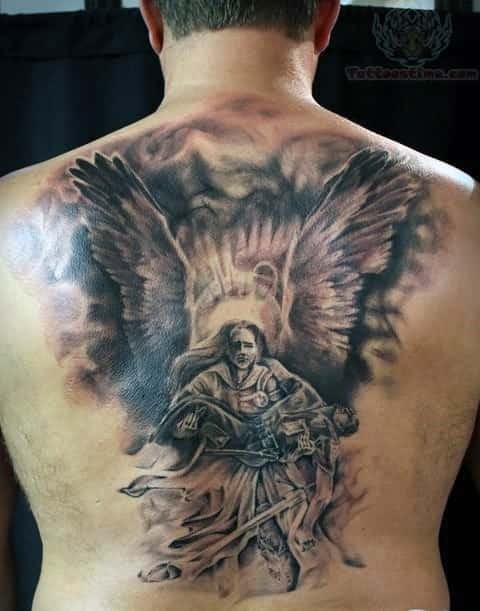 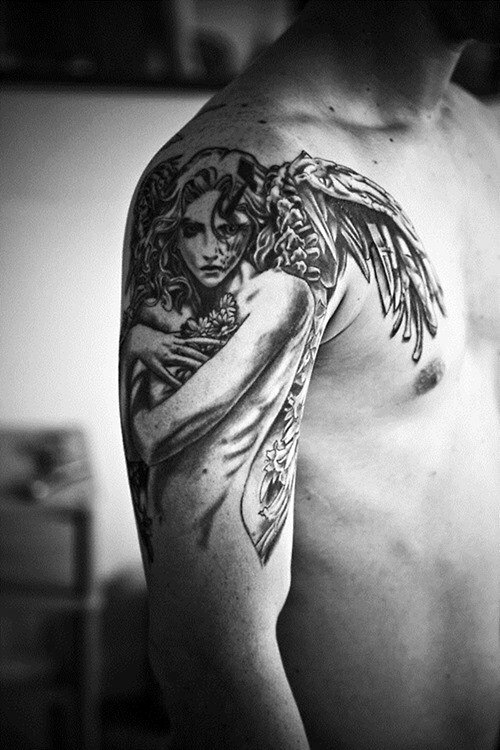 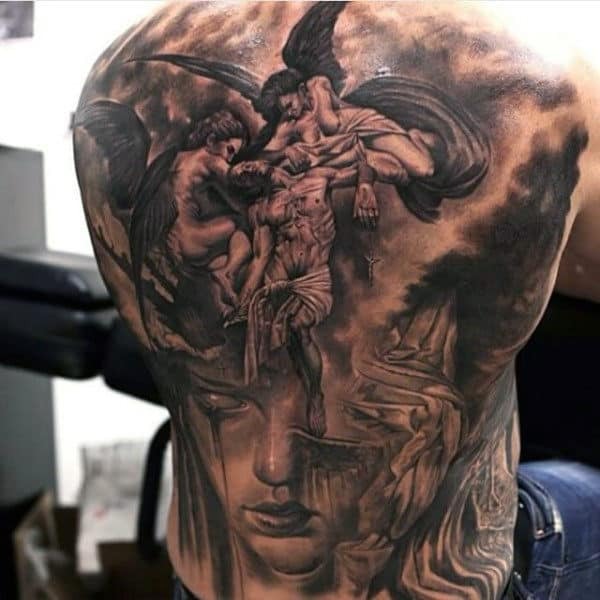 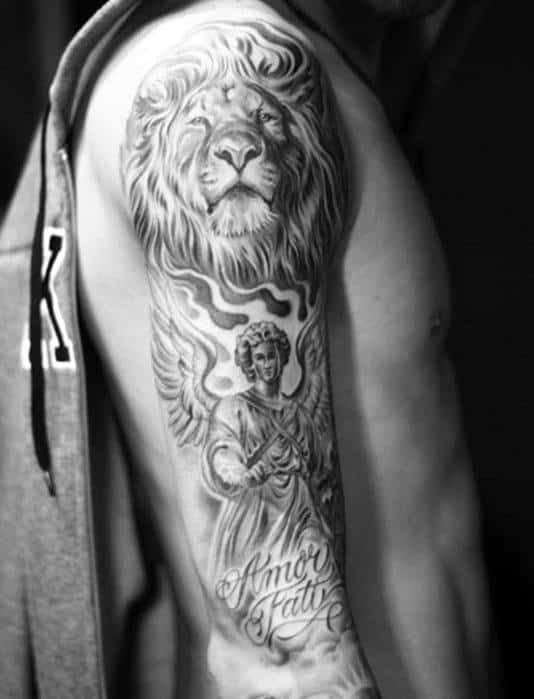 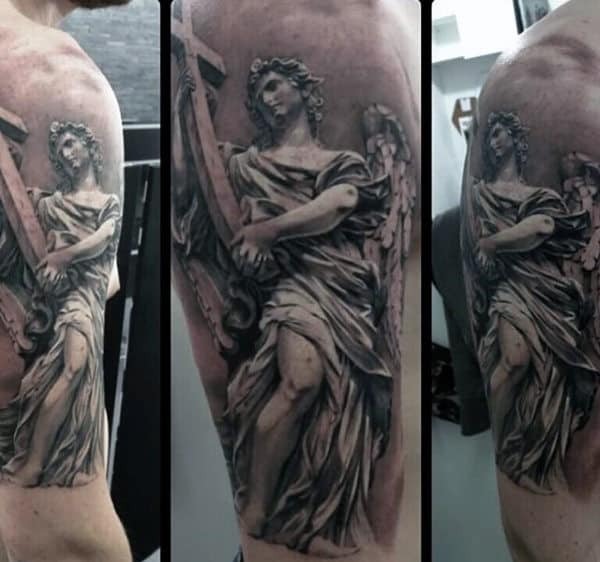 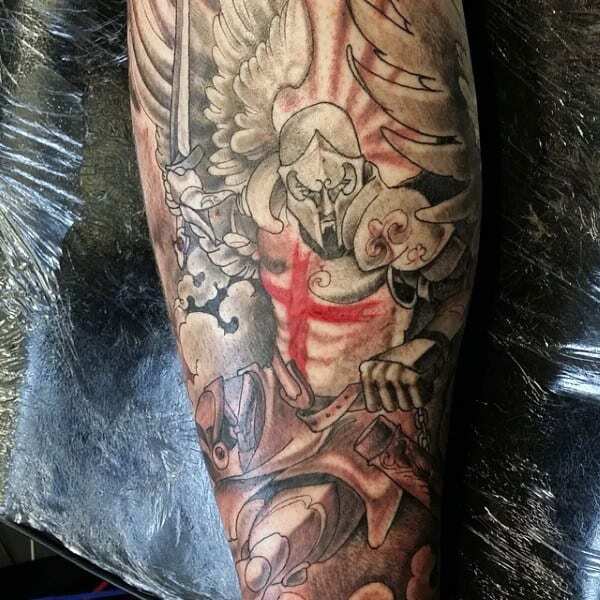 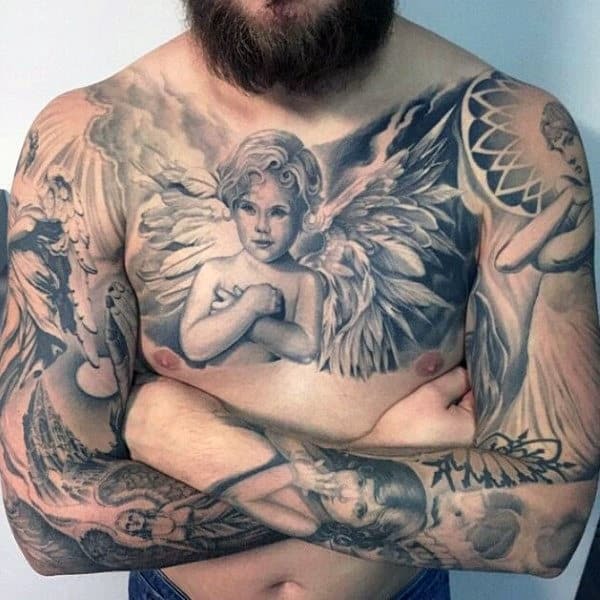 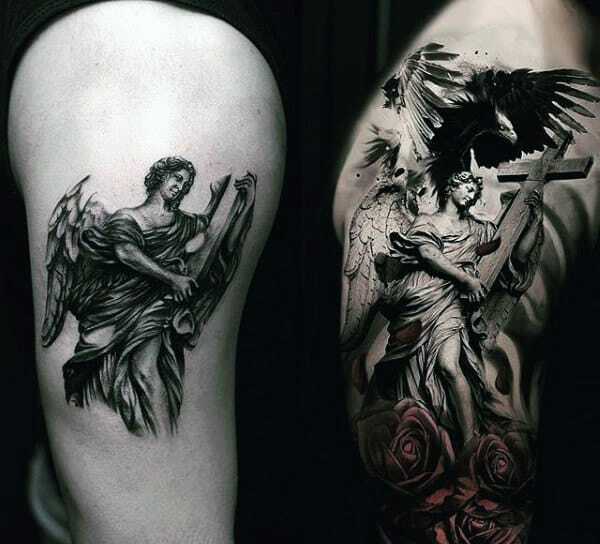 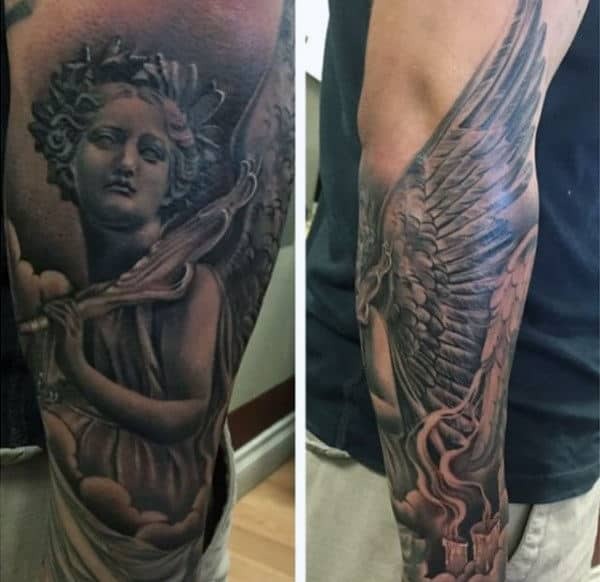 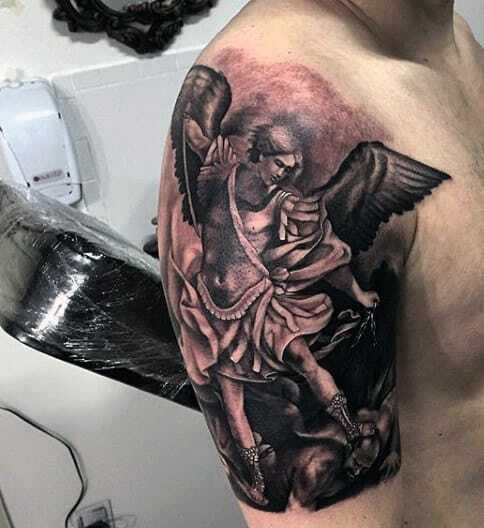 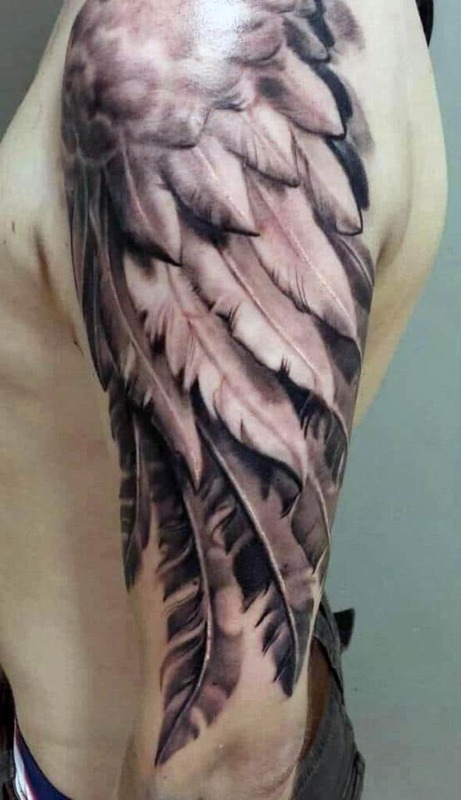 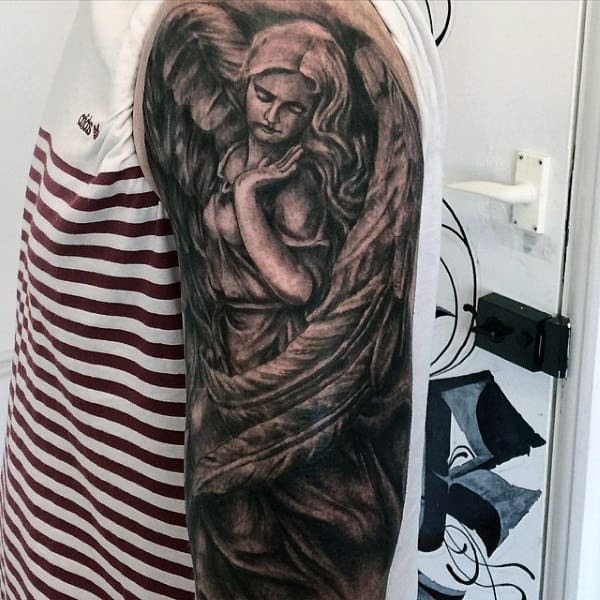 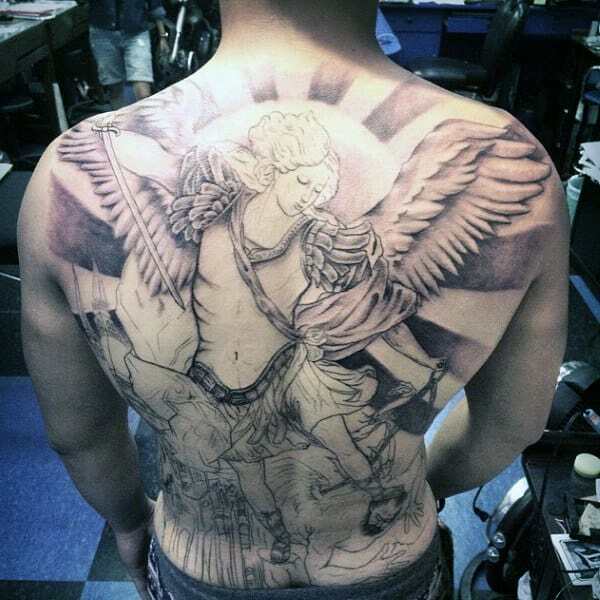 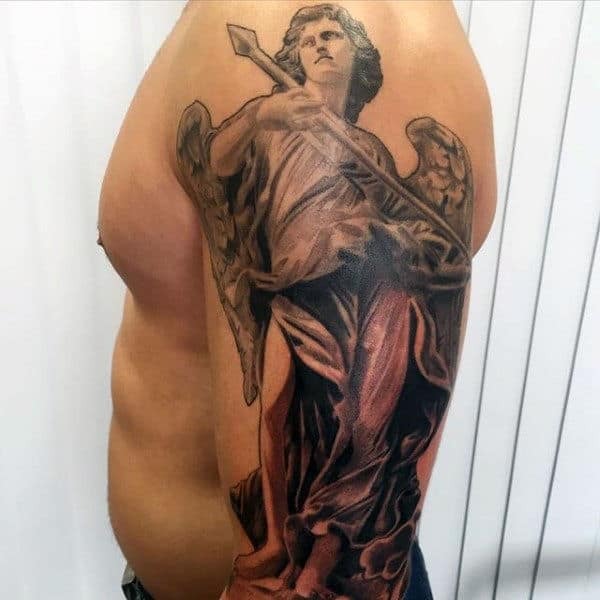 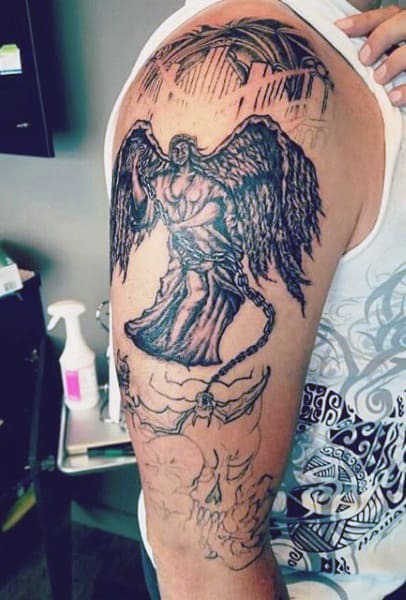 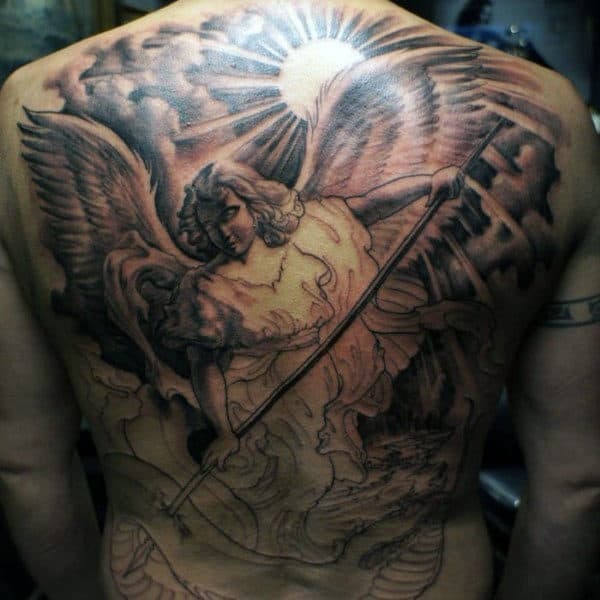 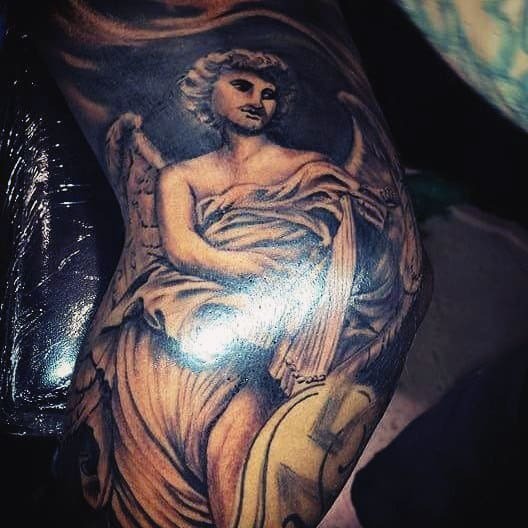 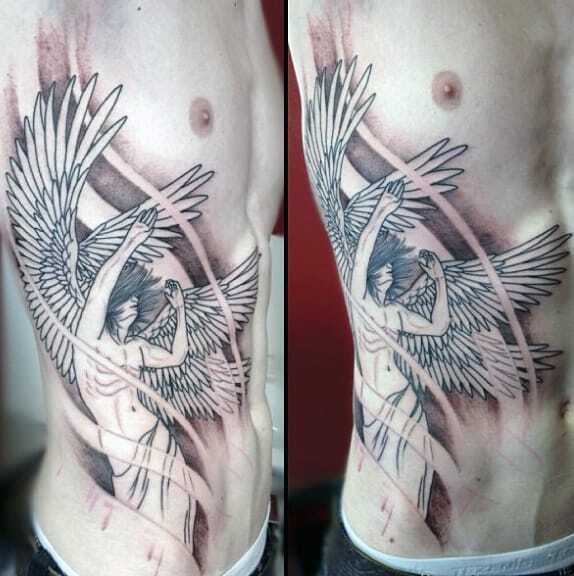 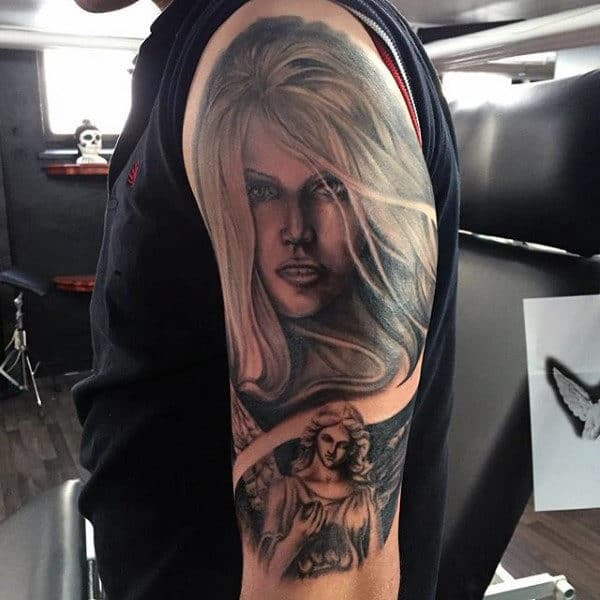 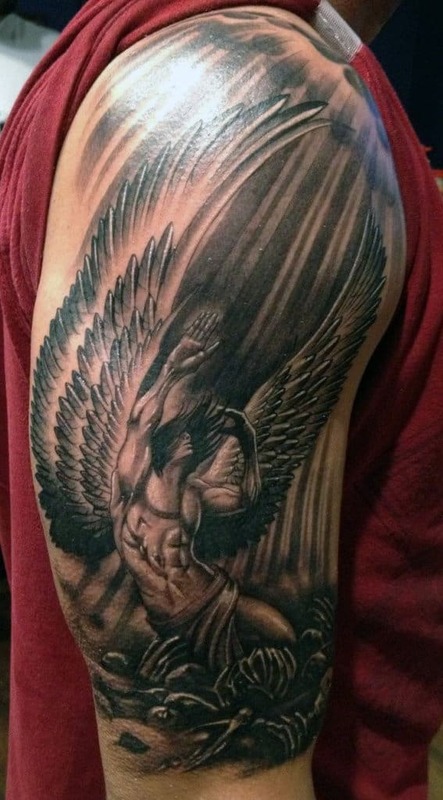 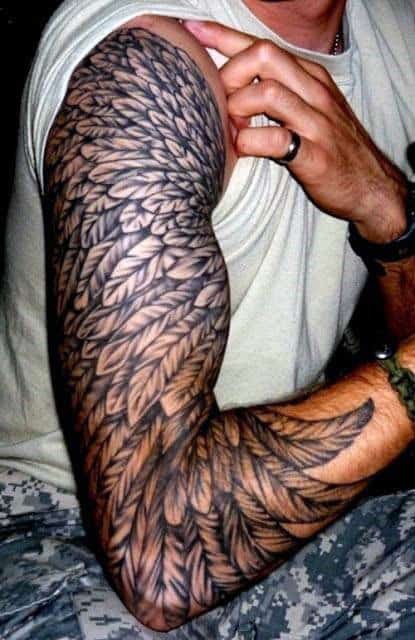 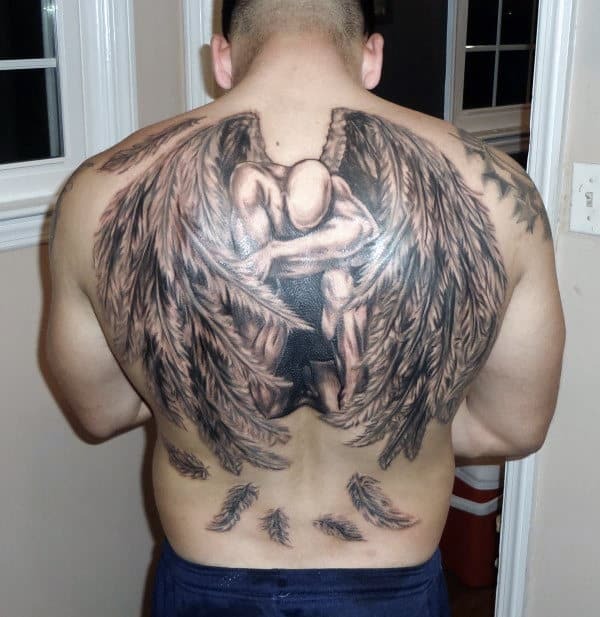 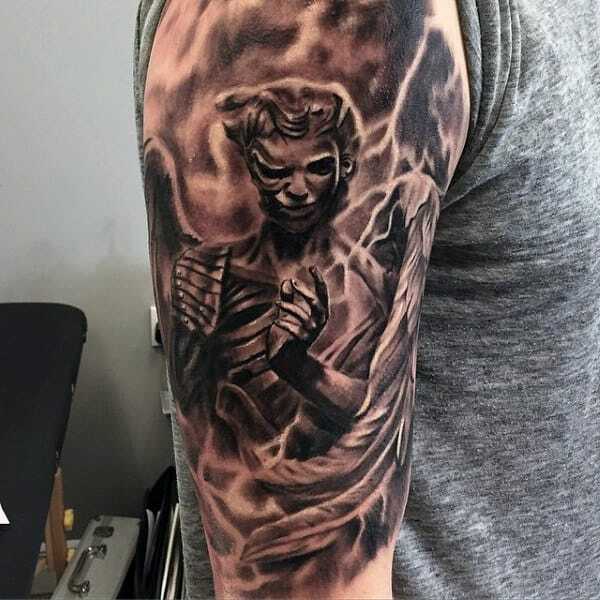 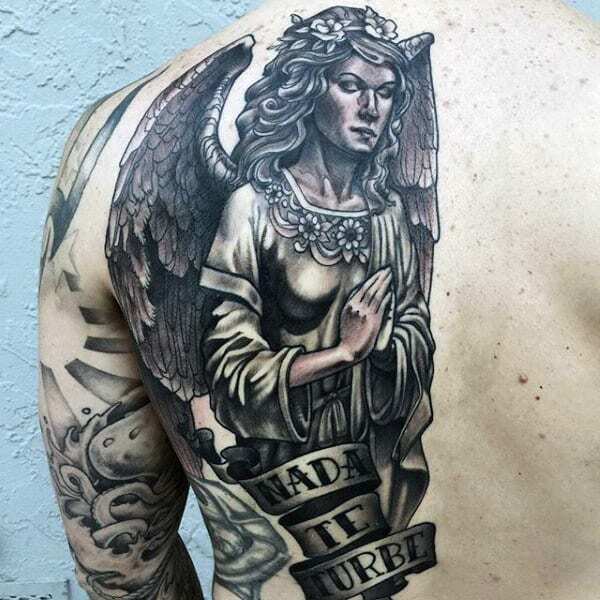 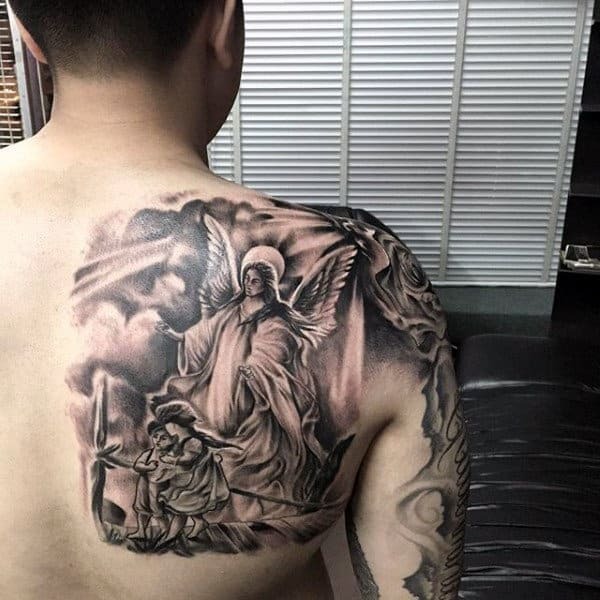 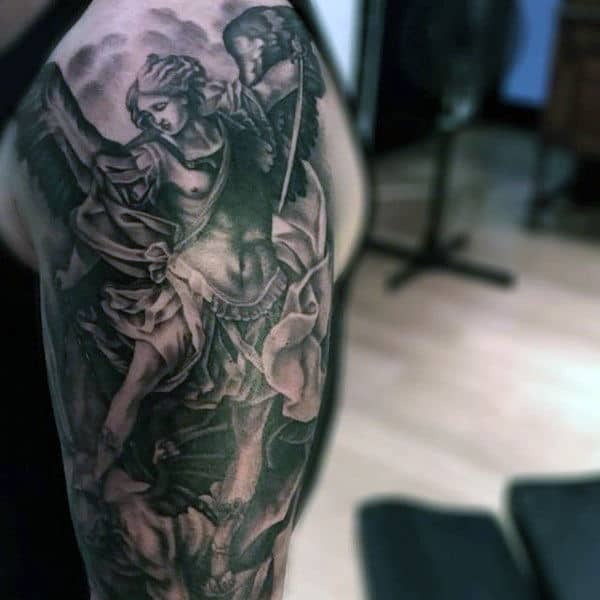 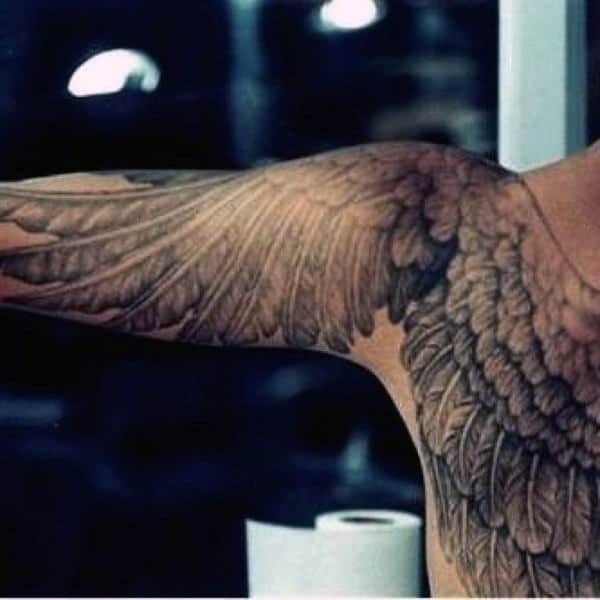 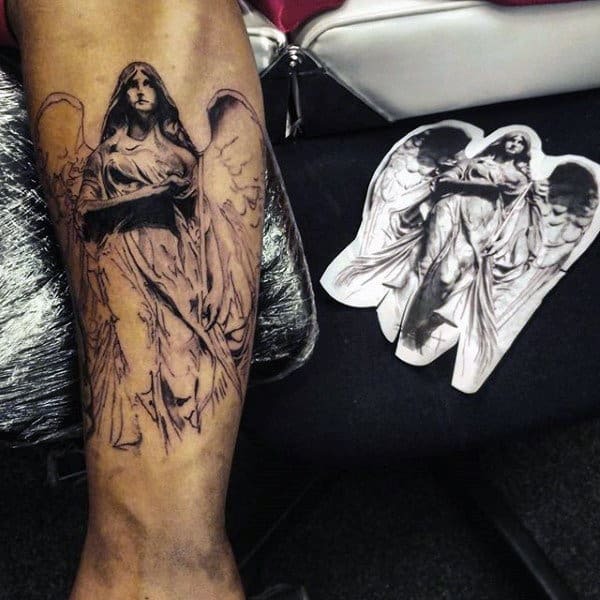 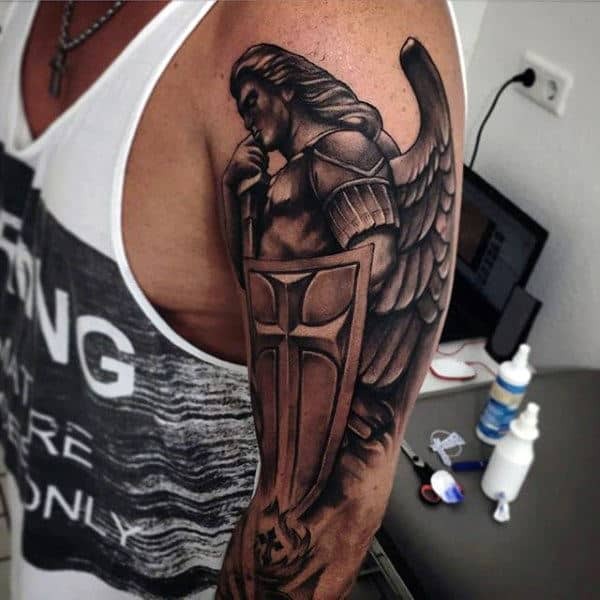 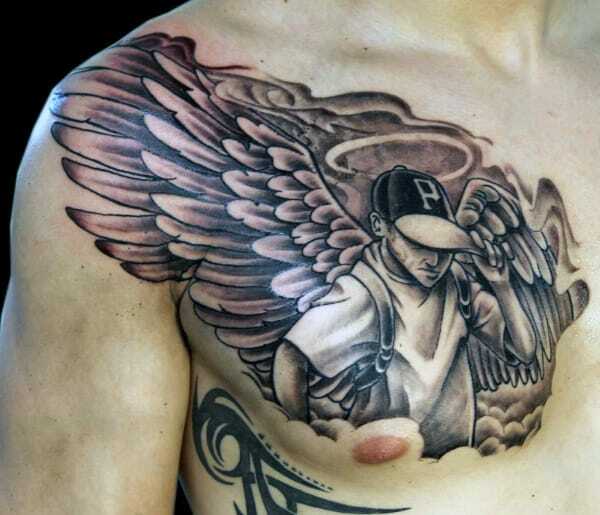 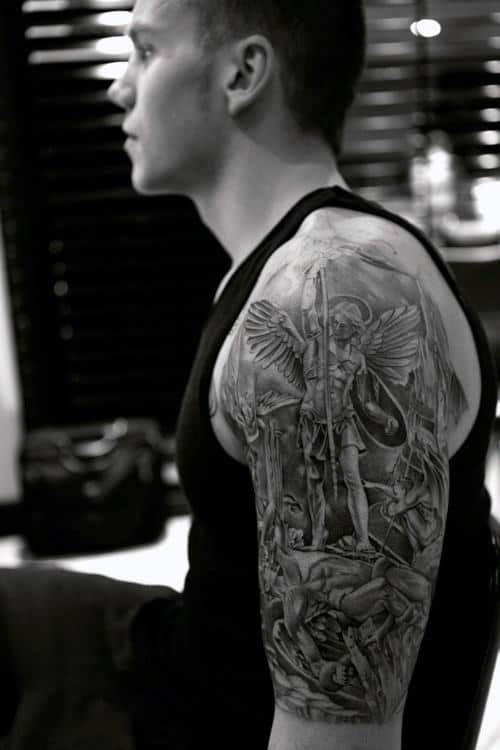 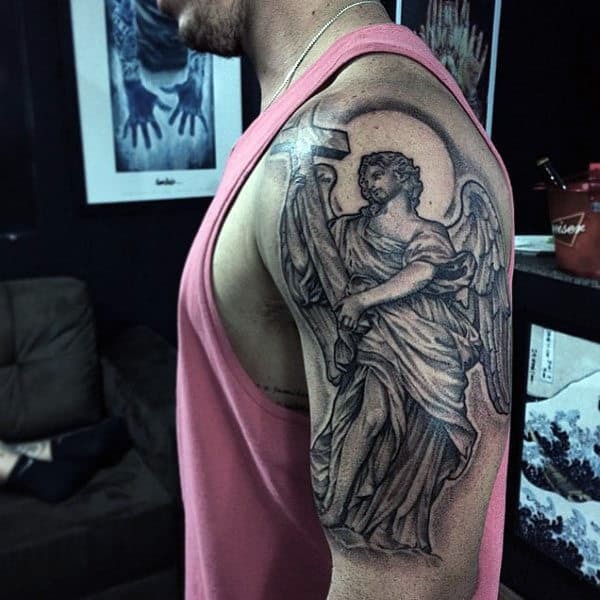 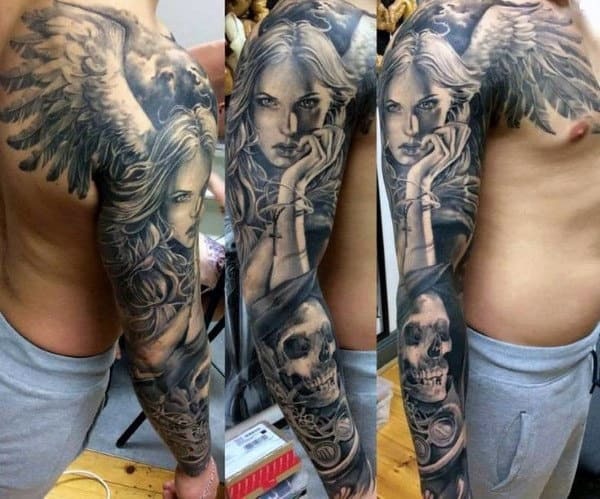 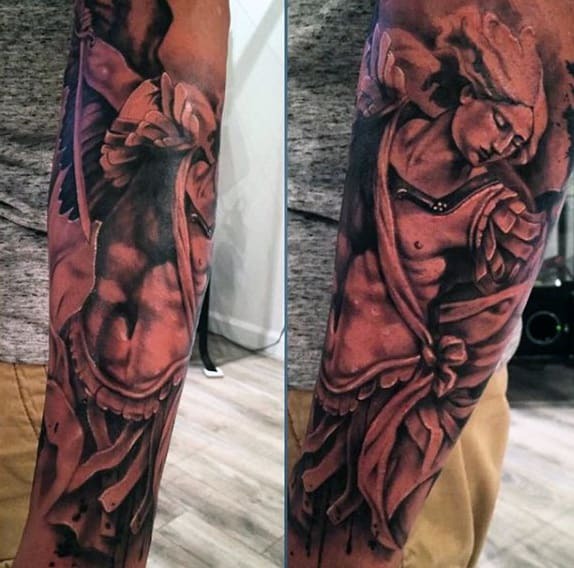 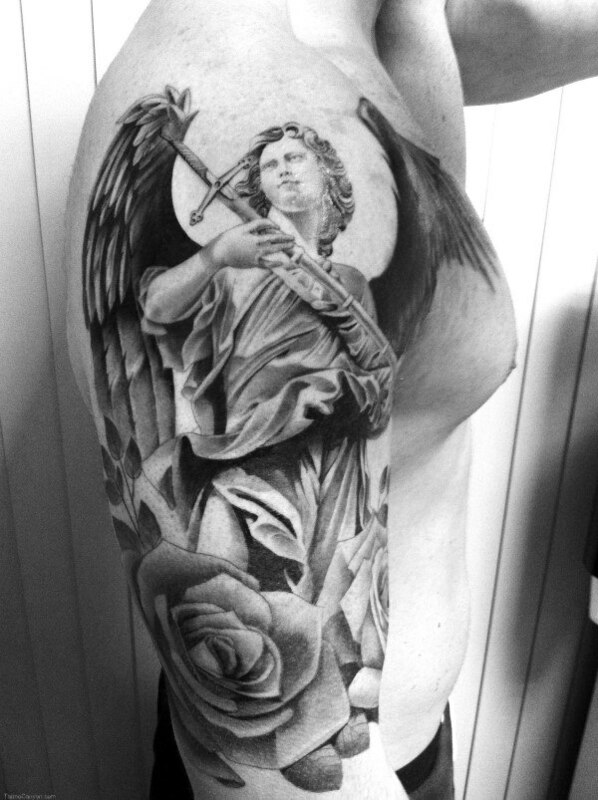 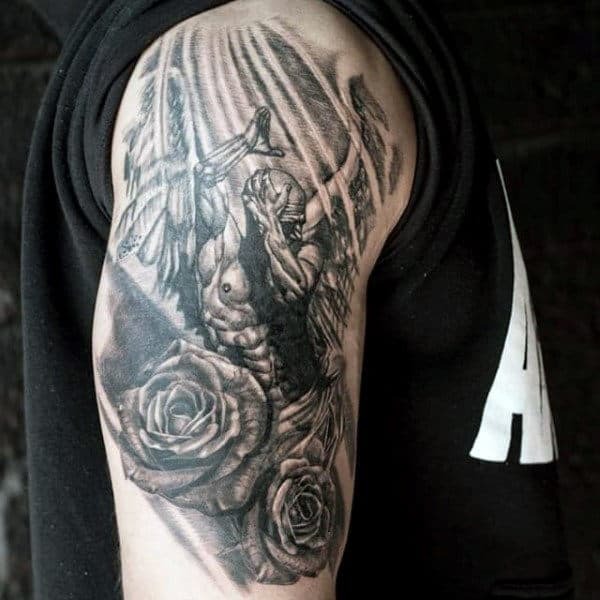 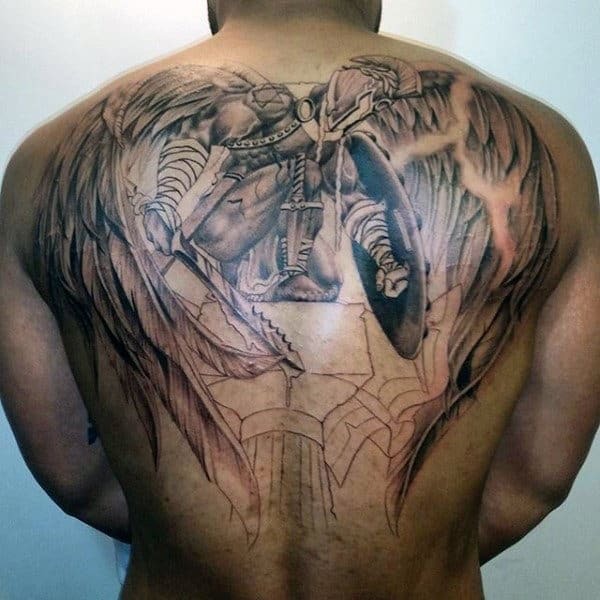 To help you come up with your ideas and beliefs on what an angel should symbolize, I’ve put together a collection of 75 angel tattoos for men. 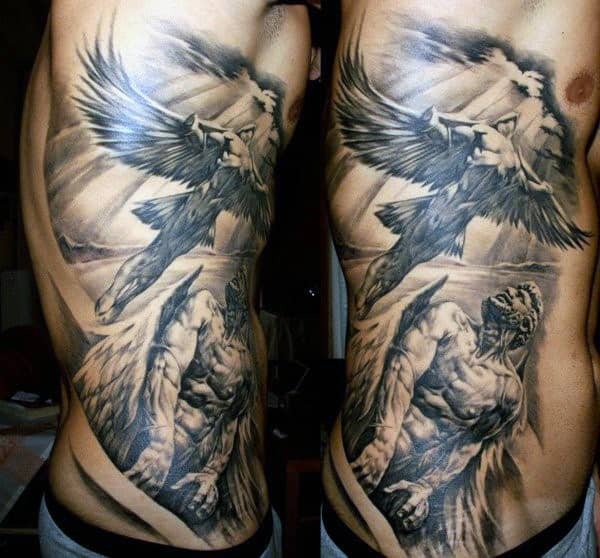 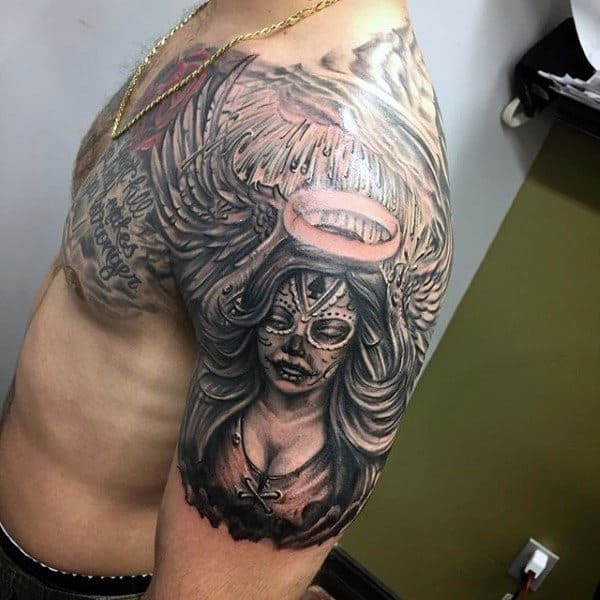 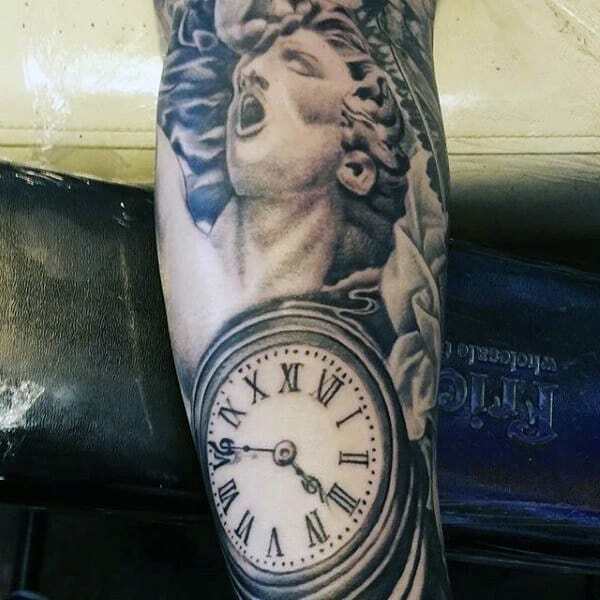 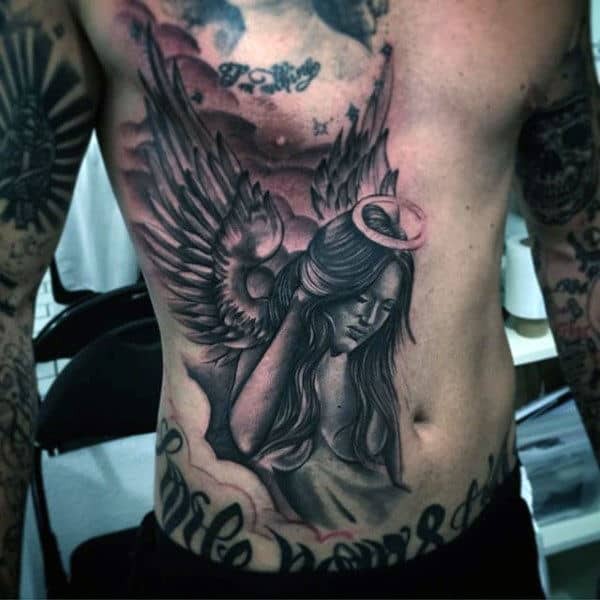 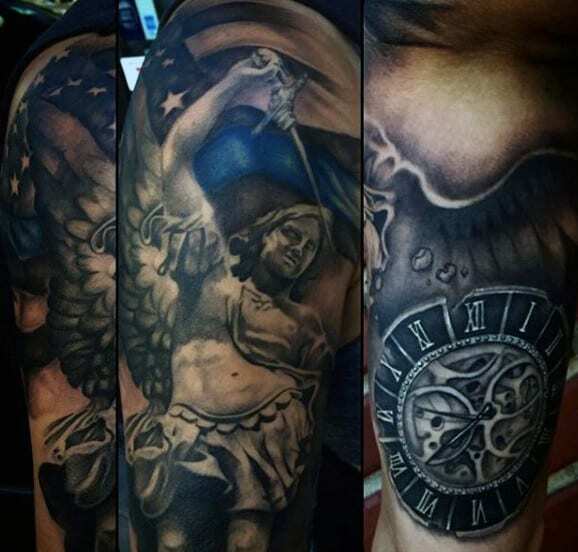 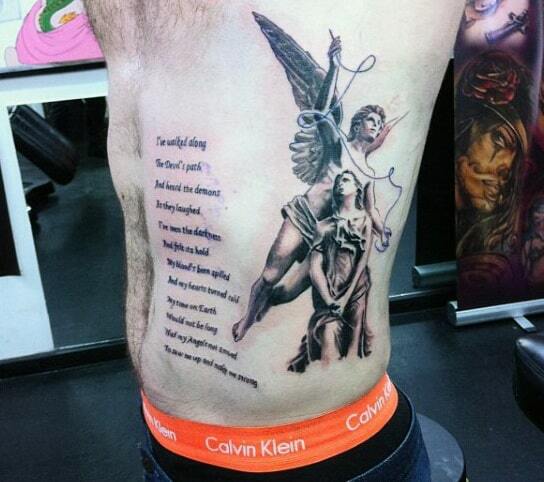 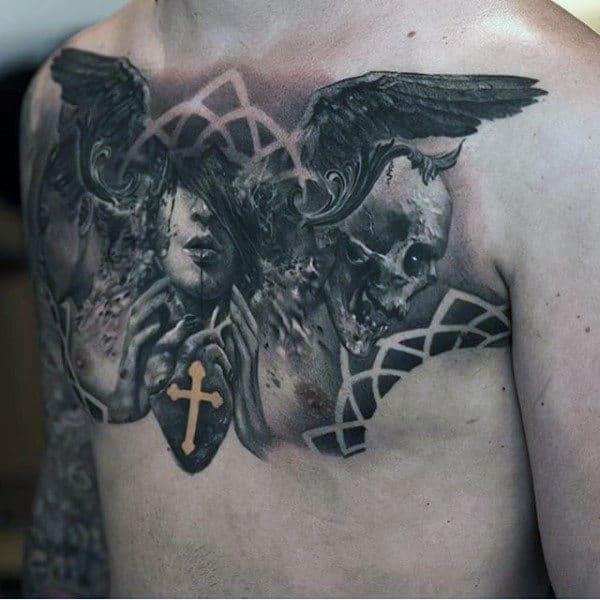 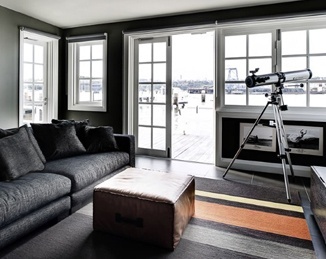 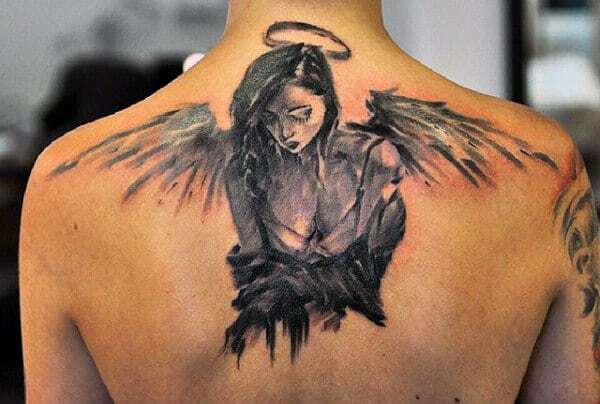 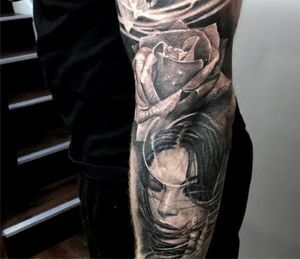 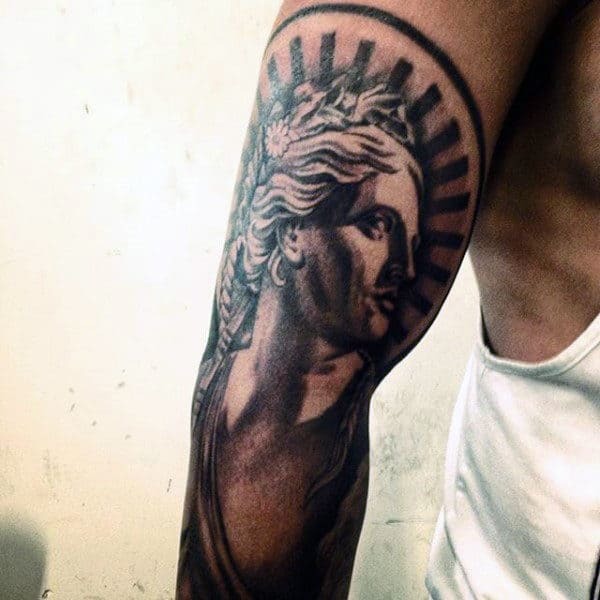 You’ll find some of the best artwork throughout the body, on the chest, arms, back and more. 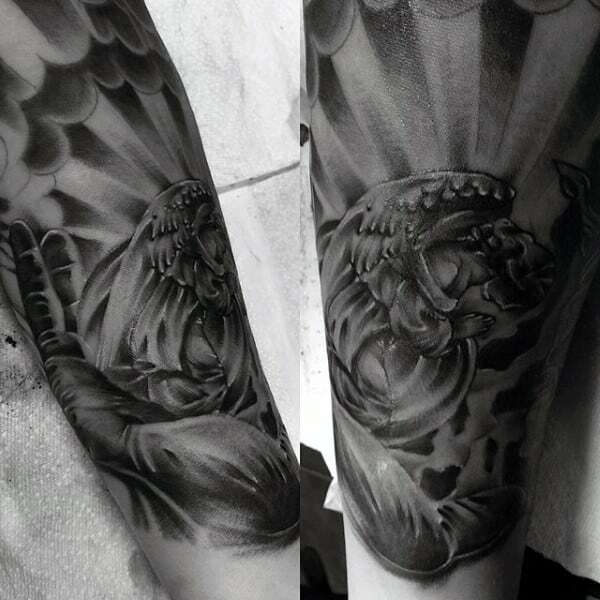 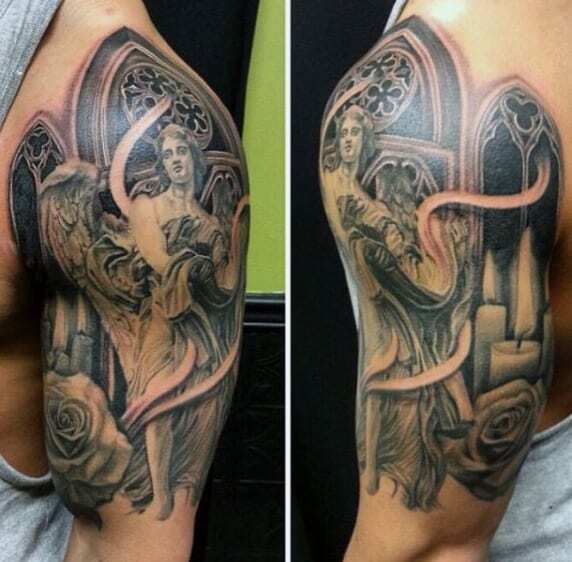 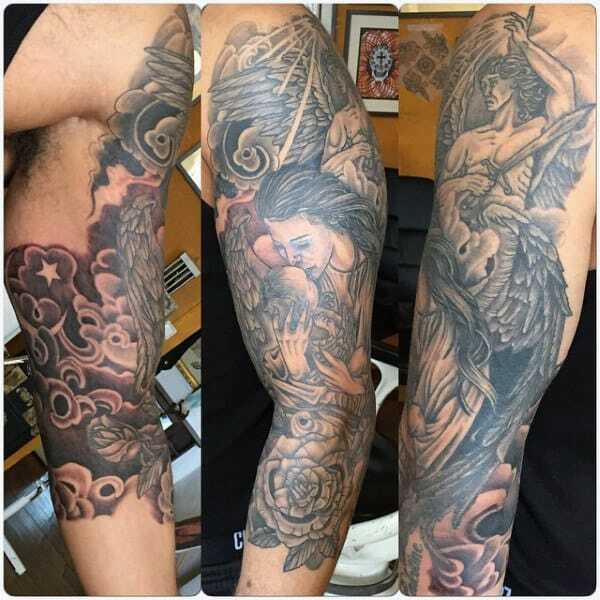 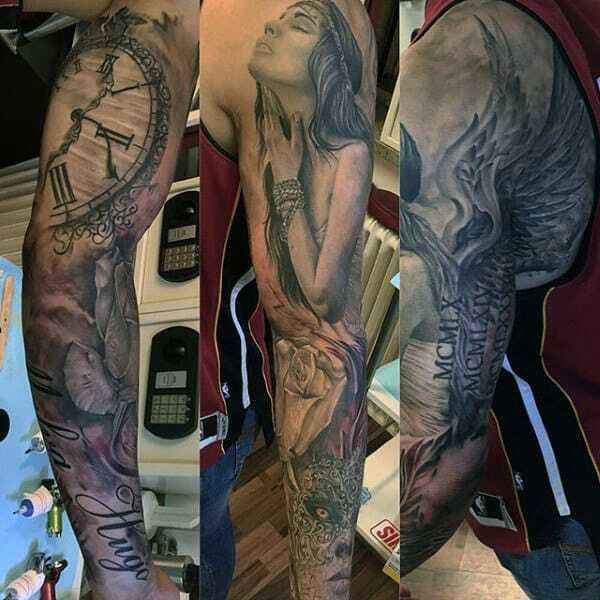 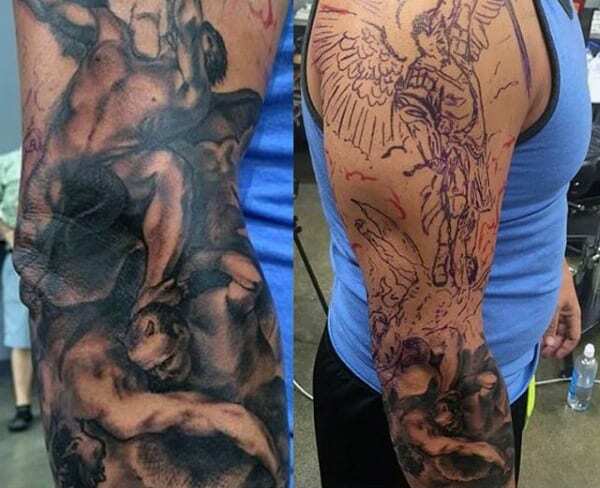 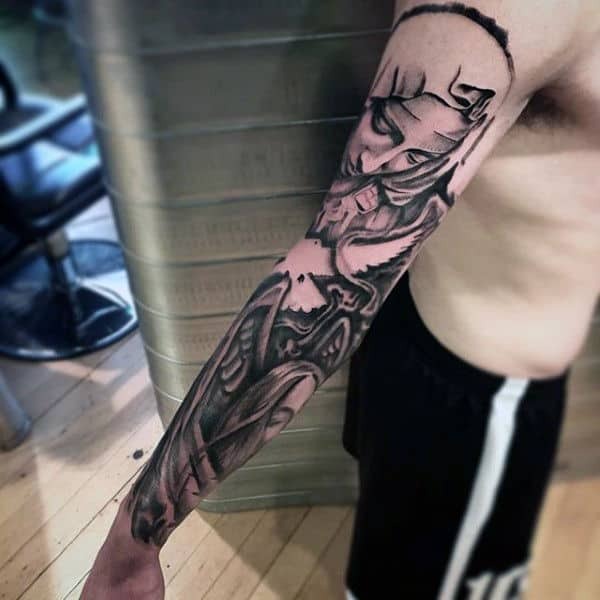 Plus full sleeves that take up some serious canvas and smaller designs that are more subtle.